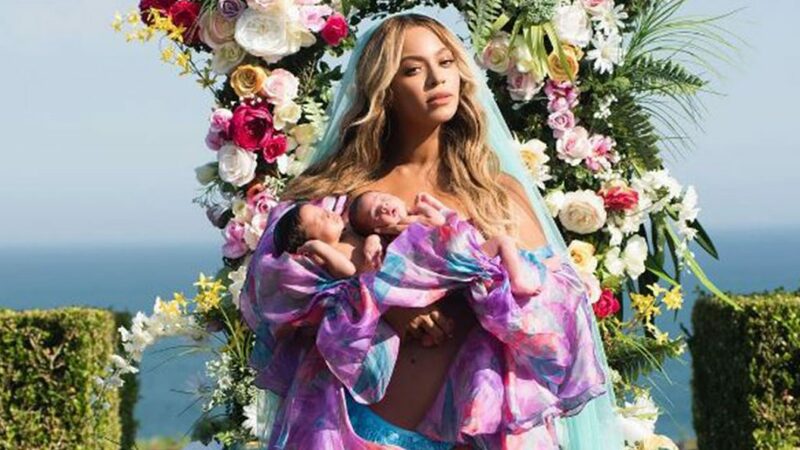 On their one-month birthday, Beyonce dropped one of her glorious Instagram photos showing her posing with the babies in front of an explosion of flowers in the garden of her $400,000-a-month Malibu rental villa and officially announced their names: Sir Carter and Rumi. Within 30 minutes of debuting on Instagram, the twins’ debut had received more than 1M likes. The twins are the latest addition to Beyoncé and Jay-Z’s family, alongside 5-year-old daughter Blue Ivy. The musical superstars filed trademark applications in the U.S. for the twins’ names late last month, TMZ reported. The pair did the same for Blue Ivy when she was born. The little boy and girl were hospitalized for a while after birth to get treatment for jaundice but they look totally healthy now. You also have to check out the full head of hair on one of ’em! So, Rumi is easy to get, with the obvious speculation that the name refers to the 13th century Persian poet. It would also mean that the baby’s full name would be “Rumi Carter”, Carter being the real last name of Jay-Z, who was born Shawn Corey Carter. The couple’s older child, 5-year-old daughter, is known as Blue Ivy Carter. But then we get to what’s presumably the boy’s name, whom Beyonce lists first as “Sir Carter.” By the way, Sir is an honorific address in many cultures. But again, Beyonce lists the name as “Sir Carter,” not just “Sir,” so does that mean “Sir Carter” is his full first name? And does that therefore mean his entire full name would be “Sir Carter Carter?” Since everything Beyonce does in public is a carefully stage-managed act of personal and professional branding, the way she wrote this caption can’t be an accident or the product of a brain-addled, sleep-deprived mom of two newborns. She wrote “Sir Carter and Rumi,” not “Sir and Rumi Carter,” implying that, indeed, Sir Carter is the baby’s full first name. Another humorous question raised on Instagram was: “If Sir Carter Carter gets knighted one day, would he then be “Sir Sir Carter Carter?” (And yes, non-British people can be given honorary knighthoods.) lol! Congrats! The Un-Challenged Privilege Of Parenting Is You Can Name Your Kid Whatever You Want! Well did we expect anything less than stand out names from the star powered couple. Although, even the Bey fanatics did have some confusion and funny remarks on the “Sir Carter” moniker the boy will be carrying for the rest of his life. As for Rumi, very prestigious to be named after a spiritual 13th century Persian poet. Lots of responsibility comes with both names and I am sure they will live up to them. Makes you wonder if Mary or Bob will ever make a comeback for baby’s names again. Lol! This is young energy and also represents the inner child. I feel this is Beyoncé’s energy about her children and wanting them to have names that will inspire and represent prestige. This is a passionate male energy who is a man of action. Being pulled inverted, I feel this represents Jay-Z and who I also feel did not have much input on the names but to just agree as he may still be trying get out of the doghouse he created with his cheating scandal. Sort of…” whatever you want dear’. This is a card of future success. I believe the card pulled clearly shows the children will have a wonderful life of privilege with all the perks of having parents with tons of money and fame can give you.